Robert Axle Project axles are specifically engineered to attach BOB Yak and Ibex trailers to your thru axle equipped bike. Machined and tested in the USA, the BOB Trailer axles are designed for maximum strength and ease of use. Use the tools below to select the proper axle for your bike. Select axle size above to view price & availability. Description is axle length(s) x thread pitch. Most axles supplied on your bike now come with the length (L) and thread pitch (TP) measurements printed on the axle. Remove the axle from your bike and check for dimensions. If you find them you are in luck and can skip steps below. Note: Axle length is not the same as hub length. A bike with a 12×142 hub standard will have a significantly longer axle. Download the Axle Fit Guide by clicking the image below. Download & print the pdf (actual size - DO NOT SCALE), and verify the accuracy of the scale with a ruler. 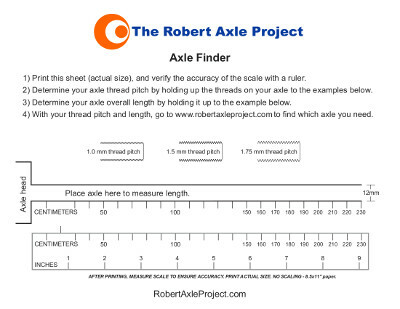 Determine your axle thread pitch by holding up the threads on your axle to the examples. Determine the approximate overall length of your axle by holding it up to the examples. The printable fit guide (click image above) is the best way to determine the axle you need. Axle Length refers to the length of the axle shaft. All axles are compatible within +/- 2mm. Axles that fit more than one length use spacers. Only 1.0 mm Thread Pitch axles come with X-12 spacer. Axles do not come with the BOB Trailer bobbins. Those are available separately, here. Or they can be re-purposed from the stock BOB Trailer Quick Release that came with your trailer. ** Lesser dimension is axle shaft measured with the included tapered X-12 spacer. Greater dimension is axle shaft measured without spacer. Only 1.0 mm Thread Pitch axles come with X-12 spacer. Use the videos (above Product Video tab) to learn more about Robert Axle Project, including how to determine what axle you need and how to install with a BOB Trailer. The true length of this axle shaft is 167mm long. This axle comes with a flat and a tapered (X-12) spacer. So this axle can be 167, 160, or 153mm long depending on spacers used. Compatible with Syntace 12x135 and 12x142 axles as well as other manufacturers with similar dimensions. The true length of this axle shaft is 172mm long. This axle comes with a flat and a tapered (X-12) spacer. So this axle can be 172, 167 or 160mm long depending on spacers used. Compatible with Syntace 12x142 and 12x148 axles as well as other manufacturers with similar dimensions. The true length of this axle shaft is 229mm long. This axle comes with a tapered (X-12) spacer. So this axle can be 229 or 217mm depending on spacers used. Compatible with Syntace 12x197 axles as well as other manufacturers with similar dimensions. The true length of this axle shaft is 165mm long. This axle comes with a 6mm flat spacer. So this axle can be 165 or 159mm long depending if the spacer is used. The true length of this axle shaft is 178mm long. This axle comes with a 6mm flat spacer. So this axle can be 172 or 178mm long depending if the spacer is used. This axle is compatible with Shimano 12x142 or 12x148 E-thru and other axles with the same dimensions. The true length of this axle shaft is 209mm long. This axle is compatible with 12x177 hub standards depending on the specific dimensions of the stock axle. The true length of this axle shaft is 229mm long. Compatible with 12x197 hub standards depending on the dimensions of the stock axle. The true length of this axle shaft is 167mm long. Compatible with 12x135 or 12x142 hub standards depending on the dimensions of the stock axle. The true length of this axle shaft is 180mm long. This axle comes with a 6mm flat spacer. So this axle can be 174 or 180mm long depending if the spacer is used. This axle is compatible with Maxle 12x142 or 12x148 and other axles with the same dimensions. The true length of this axle shaft is 180mm long. This axle comes with a 6mm flat spacer. So this axle can be 192 or 198mm long depending if the spacer is used. The true length of this axle shaft is 229mm long. This axle comes with a flat 12mm spacer. So this axle can be 229 or 217mm depending on spacers used. This axle is compatible with 12x197 hub standards depending on the specific dimensions of the stock axle. Learn how to install a Robert Axle thru-axle for a BOB Trailer. This is really a review of DHL's service, not the first time they ave disappointed. I would love to review the product, but 2 weeks after being shipped it has still not arrived and the tracking link on the dispatch note gets me nowhere. Response: Economy First Class transit time (not expedited) to certain countries such as New Zealand may take weeks and I am sorry it took longer than expected. Other faster services are available at checkout and are explained on our shipping info page. Anyway, I was able to track the package and I see it has been delivered. About a month ago I bought a Robert axle project axle for my BOB Ibex. Your request for an opinion on it arrived before the axle so my reply was somewhat frosty and critical of your courier. Luckily it arrived in time for the Kiwi Brevette which we have just completed. The sizing instructions had worked well and fitting it was very easy. The axle, and indeed BOB performed perfectly. I towed all the gear for both my wife and myself. At the finish it weighed 30kg so at times with a full load of water and food it must have been getting close to 40. There were no mechanical issues at all despite rough trails, heavily corrugated dirt roads.